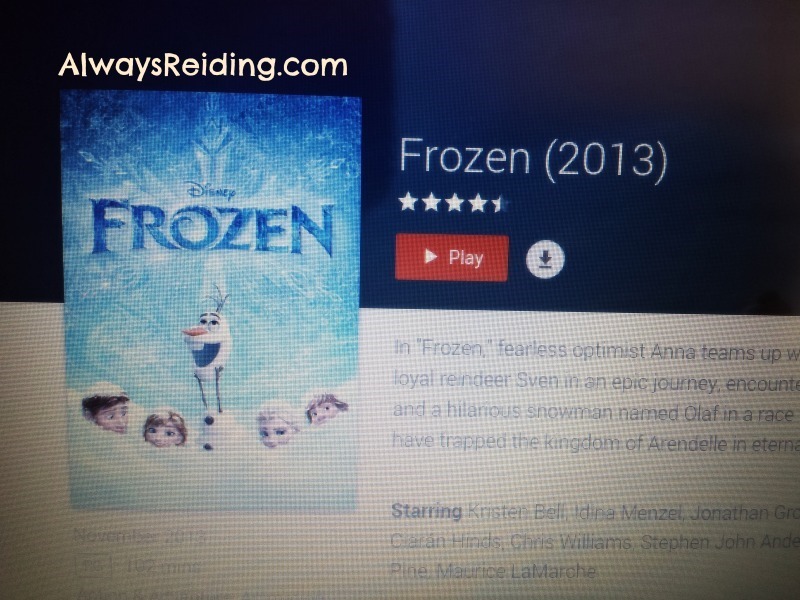 I resisted seeing Frozen for a very long time. Why? Because it was all anyone ANYBODY was talking about. Despite it being based, in part, by one of my favorite fairy tales (the Snow Queen), I had heard some things that made me question whether or not I really wanted to see it. We bought the multi-disc (with digital copy) version of the film, and I finally sat down to watch it via streaming this past weekend. Streaming worked well, because I wasn’t tied to one particular device, and I could come and go as I please. This was important, because I am not lucky enough to usually be able to watch something of this length all in one go. And, in the interests of full disclosure, let’s say that I am a HUGE Disney fan. Love the movies, the parks and almost anything that has to do with Disney, even a smidgen. I surprised many of my Disney friends who had no idea that I was so anti-Frozen, part of it being the sheer numbers in the parks interested in Frozen (it took over the Fantasyland area that Rapunzel and the dreamy Flynn Rider used to hang in, before moving to California adventure). Since its move to The California Adventure Park, it took over the Muppets theatre (hisss-boo!) and surrounding rave-like area, as well as the inside of the Art of Animation building. In Florida, the team shut down one of my favorite Epcot rides (Maelstrom) in order to open a new Frozen-themed ride in a few years. Perhaps I was a little overzealous, but I wanted to wait for a few things to die down before I saw and wasn’t forced to watch it. Frozen is, at its core, a film about two sisters, Elsa and Anna. Raised in the kingdom of Arendale by their parents the king and queen, the two sisters are really close, until the elder’s secret ice powers cause her to hurt the younger in an accident. The family spirits away in the dark of night to speak with the Rock Trolls, whose King wipes the memory of the younger. Elsa locks herself in her room, and Anna grows up without her sister—and without her parents whom perish in a shipwreck (or did they?) and when it is time for the coronation, the closed up kingdom (and its castle) opens its doors for the first time in nearly forever (see what I did there?!?). Anna meets a guy, talks about sandwiches and wants to get married, causing the ire of her sister, and causing her sister’s ice powers to manifest and an eternal winter falls across the land. So Anna does what anyone with a sister does right after a massive, manic fit—she goes after her. But, will Anna be able to go after her beloved older sister, or is her heart already frozen? Okay, so there are definitely guards in the palace, and outside. How in the world did the family make their flight to the stone people without alerting any of the guards? Also, who is freaking in charge? Did the girls have any help to train them or advise them? Did they go to school? Because, based on Elsa’s antisocial behavior with just one or two people, I don’t know that she was tutored. And, had Anna been socialized, she would not have fallen in love with the first guy who said ‘hi’ to her. Maybe this hits a little too close to home, but I can’t even decide how this works. But, let us speak of what I do enjoy about the movie. First, there’s a fan theory about Tangled and Frozen. Also, I enjoyed the chase scene, featuring the sled. And the idea of a summer shop on an icy mountain, with a sauna. And I enjoyed the reindeer. I also love that there is a love interest, but he doesn’t save the day. This is, at its core, a movie celebrating sisterly love. While I wasn’t overly enthusiastic about the movie, it is a pretty film. And, I think that it has a great message to young girls. However, that being said, I don’t get the huge FROZEN mania. Seriously. Filed Under: 2015, Disney, Geeky, Pros & Kaaaahns!